How To Get To The Department of Foreign Affairs (DFA - OCA) Aseana Business Park? The Office of Consular Affairs is responsible for the issuing of passports to Filipino Citizens. Before this office can be found in the DFA compound along Roxas Boulevard and Libertad Street. 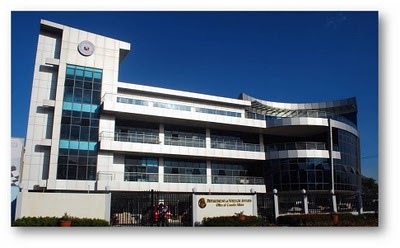 Around March of 2010, the Department of Foreign Affairs transferred the office to a new location in Aseana Business Park which is along Diosdado Macapagal Boulevard corner Bradco Avenue is Brgy Tambo, Paranaque City. This four-storey building hosts the Authentication and Passport Services (both new application and renewal) functions. For those who are used to going to the DFA building along Roxas Boulevard, this would seem to be a drastic change in practice, especially if there is a need to renew passports in a month or two. But there are reasons for transferring locations. One is for modernization and another for streamlining the procedures - particularly fending off fixers. Machine-readable passports (MRP) are no longer issued by DFA; they are now issuing biometric/e-passports. 1. The DFA highly recommends that you set an appointment online (http://passport.com.ph/set-appointment) or via telephone (737-1000) before going there. Unlike the old process in the DFA building in Roxas Blvd, the new process does not accept walk-ins. 2. Make sure to have read all the instructions online (http://passport.com.ph/what-to-expect) and asked all the importan questions when setting an appointment on the phone. Some things to make sure are requirements (e.g., what forms to fill up, are photos still needed, etc). 4. DFA Hotline is +632-834-4000. If you have questions, dial in this number. 5. Inside the DFA, signs may not be present on where you need to go - don't be afraid to ask the guards around. 6. No need to bring photos as the e-passport requires one to be physically present to take their pictures onsite; so, take note that you should bring your kids since they have to be there. 7. If there's a very urgent need, some people's advice is to prepare a letter explaining the need and go directly to Passport Division. This, of course, is not guaranteed, provided that there would be a lot of applicants with the same case as well. - An additional fee of Php 200.00 will be charged for processing of Lost Passports if it is still valid. *Remember to take note that the DFA Office's main landmark streets are Bradco Street, Diosdado Macapagal, and Roxas Boulevard. Nearest LRT 1 and MRT Station is EDSA-Taft Avenue Station. Jeepney rides from Baclaran LRT Station is also practical. Option 1. From Monumento, there are buses plying along EDSA that have signboards saying MIA-611 Tambo. This bus route will surely be passing by DFA building in Macapagal Boulevard. Option 2. From Monumento, ride a jeepney along Rizal Avenue bound for Taft Avenue and asked to be dropped at EDSA. There are buses plying along EDSA that have signboards saying MIA-611 Tambo. This bus route will surely be passing by DFA building in Macapagal Blvd. Option 3. From Monumento, take an LRT 1 Yellow Line going to EDSA-Taft Station and look for buses bound for MIA-611 Tambo. Option 1. Ride a jeepney along Rizal Avenue bound for Taft Avenue and asked to be dropped at EDSA. There are buses plying along EDSA that have signboards saying MIA-611 Tambo. This bus route will surely be passing by DFA building in Macapagal Blvd. Option 2. Take an LRT 1 Yellow Line going to EDSA-Taft Station and look for buses bound for MIA-611 Tambo. Option 3. From Lawton/City Hall area, ride a jeepney going to Baclaran and asked to be dropped Bradco Street. This is the street of DFA-OCA building. Walk some 500 ms. (around 5-10 mins walk). Option 4. Along Roxas Boulevard or from Lawton/Manila City Hall, there are FX that are taking the route of Sucat-Lawton. You can ride this and asked to be dropped at Bradco Street. This is the street of DFA. Walk some 500 ms. (around 5-10 mins walk). Option 1. Take the LRT2 Purple Line and go down at Recto Station. From here, transfer to Doroteo Jose Station of LRT 1 Yellow Line and ride an LRT bound for EDSA-LRT station; there are buses that have signboards saying MIA-611 Tambo. This bus route will surely be passing by DFA building in Macapagal Blvd. Option 2. From Cubao, you can ride a jeepney/FX that is bound for Quiapo and ask to be dropped at Rizal Avenue. Ride an LRT 1 bound for EDSA-LRT station via Doroteo Jose Station. There are buses that have signboards saying MIA-611 Tambo. This bus route will surely be passing by DFA building in Macapagal Blvd. Option 3. From EDSA, there are buses that have signboards saying MIA-611 Tambo. This bus route will surely be passing by DFA building in Macapagal Blvd. Option 1. You can ride an MRT southbound to EDSA-Taft Station and and look for buses bound for MIA-611 Tambo. This will pass by DFA. Option 2. From EDSA, there are buses that have signboards saying MIA-611 Tambo. This bus route will surely be passing by DFA building in Macapagal Blvd. Option 3. You can ride an MRT southbound to EDSA-Taft Station and from there ride a jeep or bus going to SM Mall of Asia. There is a jeepney terminal where you can ride a Baclaran/Macapagal Blvd bound jeepney that will pass by DFA. Option 1. From SM Mall of Asia, there is a jeepney terminal where you can ride a Baclaran/Macapagal Blvd bound jeepney that will pass by DFA. Option 2. Ride an FX or bus bound for Manila City Hall or Lawton that passes through Roxas Boulevard and get down at Bradco Street, which is the street of DFA. You might need to use the footbridge. Option 3. Along Roxas Boulevard, there are FX that are Sucat-Lawton. You can ride this and asked to be dropped at Bradco Street, which is the street of DFA. You might need to use the footbridge. For private vehicles, the DFA-OCA building is accessible via Diosdado Macapagal Blvd. From EDSA (MOA-bound), turn left upon reaching the corner of Diosdado Macapagal Blvd. The building is located on the left side and is beside a Petron Gas Station. Parking is no problem said those who brought their cars onsite. Of course, you can ride a taxicab from any point in the metro and just mention to the driver to drop you off at "DFA sa Macapagal Blvd" or "Aseana Business Center Macapagal Blvd". 187 Responses to "How To Get To The Department of Foreign Affairs (DFA - OCA) Aseana Business Park?" panu po kung sa españa manggagaling? salamat! Hi! Kung galing Espana, sakay ka ng LRT na pinakamalapit, Doroteo Jose Station (sa may Recto), tapos baba ka sa EDSA-Taft station at sakay ng bus na MIA-611 Tambo o kaya baba ka sa Baclaran Station at sakay ka ng jeep na papuntang MOA, more often than not, dadaan siya sa DFA-OCA. Hope this helps! ah. ibig sabihin po pala eh wala talagang dumadaan na FX or Bus or jeep na papuntang baclaran na dumadaan sa bradco? ok po. mag lrt nalang ako tapos baba nalang ako ng baclaran... salamat po sa tulong. Yup! ganun nga. :) ingat at sana di matagal ang appointment mo. kaya ang pinakamaganda gawin kung galing ng españa eh yung option 2, 4 and 5. meron din ako nakitang bus sa lawton na papuntang baclaran/sucat, lumiliko sila mismo sa bradco street pero yung iba lang. paano po pumunta sa dfa paranaque kung sa baliuag, bulacan pa po manggagaling??? need ko po sana answer asap... thanks much!!! hi, kung sa baliwag bulacan, why don't you try the "From North of Manila" or "From around Manila" options above. From Baliuag just ride a bus bound for Monumento or Lawton. Hi, im from Tarlac and scheduled to renew my passport next week. Can you instruct me on how to get there if i will come from Victory Liner Pasay terminal. Hi Michael, there are two ways, from Victory Liner, ride a bus with sign of MIA-611 Tambo. Or you can ride a bus to SM Mall of Asia and look for the jeepney terminal to DFA. Hope this helps. This is a very informative blog site. Thank You for this, I got one question though, If I will be riding a bus from edsa (MIA 611-Tambo), dadaan ba muna ng MOA yung bus before sya dumaan sa mismong harap ng DFA? hi pierre, I think hindi, dun ata siya lumiliko sa macapagal avenue agad. Though MOA is just very near. Tanong ko lang po kung manggagaling ako ng LRT buendia,then sakay ako papuntang mall of asia?sure po bang may terminal ng jeep na dadaan ng DFA? hi taga novaliches po..anu po ba yong dapat ko sakyan papunta ng dfa? pag novaliches, ride a bus pa rin, going to MIA-611 tambo. hi, how many hours would it take to reach the new dfa if you're from fairview? i'd like to estimate my hours of travel since one is suppoosed to arrive 30 minutes before the set appointment time..thanks! Do u have online application for the first timer and okey lang po b n magpast ng requirements true ur website and pwede din po b?ipadeliver s house once nprocess n po ung passport. Hello jarish86 - you should personally appear at DFA-OCA because that's their way to verify. pano po pumunta dun pag manggagaling ng philcoa? Hello Gerald - sakay ka lang ng bus na may MIA-611 tambo na signage. Hi! This is Tess. Is there a possibility na makuha in 5 days sa rush processing yung passport? Hello Tess - I don't think so. 10 days na ang pinakarush ng passport eh. Yung hindi rush 28 days. what about request for extension of official passport? what are the requirements? thank you. Hi! I just came from province. From Sampaloc, Manila paano po papunta sa DFA Aseana? Please help. Thanks! Denmark - sakay ka lang ng jeep going to Taft, tapos jeep uli to DFA. anong sasakyan kong jeep kapag nasa baclaran nako, yung may mga yellow cab papunta ng moa? hello po. ask ko lang po kung wede din yung bus na ayala/lrt galing ng starmall. kasi i remember dumadaan sila dun. thank you for answering all the question .. god blesss..
Hello! Pasensya na po kayo! We're trying our best to accommodate all Qs. Mag-isa lang po ako right now :( and may questions pa over email. Thanks for the support and patience! hi there, ano ano poba yung mga dapat kong dalhing papeles pag late registered ang birth certificate ng bata? Paano po ba makapunta ng DFA if galing ka ng NAIA Terminal or Old Terminal? Ano po ang puwedeng magandang sabihin sa taxi na confident ka po for a shortcut from Terminal. Mga magkano po ang taxi fare? Maraming salamat! God bless you! kuya, if from laguna ako? ano bus ang sasakyan ko? and san po ako baba? Hello po.ask ko lang po kung magpaparedribbon po ng documents like TOR at diploma e sa old dfa po b?dun sa libertad,manila? pano omunta ng dfa luma pra magpa red dibbon? tanong ko lang po sana kung galing ako dito sa may sm southmall las pinas anu ba dapat ang sakyan ko papuntang dfa? pagbaba ko po ba ng pasay terminal,nandun na din po ba ung bus papuntang mall of asia? panu po pag galing pong alabang? hi just wanna ask if may parking lot sila coz i'm planning to bring my car. anu po sasakyan if manggagaling sa tayuman tondo? mas ok ba mag taksi from sta.cruz to dfa ? panu poh magpunta ng tayuman kung galing ka ng cavite,,??? hello.. panu po papunta DFA from NAIA po??? any suggestion except magtaxi.. baka ipaikot.ikot lng pag mag.taxi.. hehehe..
Nagtransfer n Authentication(Red Ribbon) sa Aseana DFA since Nov 22,2012. .,ask ko lng po pano ba pumunta ng dfa office pag galing na dasmarinas,cavite? .,nagpa schedule po ako last january....tpos appointment date ko ay feb 1,2013..ngaun po ipapa print out ko na ung appointment form ..sabi po sa web site di nila makita yong appointment ko..pano po yon..puede po ba pumunta jan khit di ko dala yong form? gud pm..ask ko lng po pano po pgpnta s dfa paranaque,,d2 po manggaling s starosa city laguna,,ano po sign board nf bus pede k skyan/or ano po byahe ng van pede ko skyan..to get there?thankyou po. I will drive going to DFA on March 1 2013, if my location is already in Roxas Blvd, going to MOA (which I have to turn right) nasaan po ang DFA? lalagpasan ko po ba yung way going to MOA, need to us UTurn slot or what, didirecho lang po ba, nasa left po ba ang DFA kung tapat sya ng papuntang MOA????? This is so very helpful. Thank you so much! God bless. Sa north edsa po ako..ano po ang pede kong sakyan papuntang dfa? hello, gud am\! tanung ko lang po kung nag-iisa lang ang dfa dito sa manila, kasi po nagparenew ang father ko at sa may16 na ang schedule nya, e nung nagparenew po kasi ako my cnlick ako na sm maynila, san po ba dapat pumunta? dun sa dfa sa pasay? or sa sm maynila po? my kuhanan din po ba ng passport dun sa sm maynila? thank you po..
hi epo sa lahat, may naka alam ba kong ano ang requerement sa pag kuha ng pasport certified through coppy. Thank you for this very helpful information. It has helped me a lot. You are doing a valuable public service. God bless your work and may you help many more who need directions. good day how do i get to pasig from dfa? hello. ask ko lang if galing ako ng recto kasya na ba ung 1hr para makarating ako ng dfa aseana on time? gud eve.po..paano po ako mka2rating ng dfa galing po ako ng pedro gil?help po...thanks..
what if need ko mag authenticate ng dokumento?san b aq pupunta from here in carmona cavite? how can i get to moa from crossing calamba? anu po bang sasakayan ko. at saan ako dapat bumaba? How much will be the fare from MOA to DFA via Taxicab. Or from Baclaran LRT Station.. thanks. how can i get to aseana dfa from crossing calamba? anu po bang sasakayan ko. at saan ako dapat bumaba? mron po b terminal s coastall mall p DFA-aseana? Nagpa renew ako passport. Rush for deliver y access sa Dhl. Sabi 10 working days pero until now wala pa passport ko insted april 30 , 2014 ko matatanggap. May 4 na wala parin. ask kulang po panu ang process pag pa lost passport ka? kasi galing ko ng lebanon hnd kasi maganda ugali ng amo ko kaya i decided na pumunta ko ng embassy kaya hnd na surrender ung passport .. kaya plan ko na mag pa pasport ulit pls help ... what firts step that im going to do ? Hindi kong a lam kung piano kong makapaguumpisa umpire s h a n kong making salespagiging kong I sang marital is a ng laying I sang Tulsa dukes. O I sang Kawasakikong easy as y go lucky Ryan sardines palpably labor kung sana sana hanging out with, my friends ,maximised kong Atlanta's high at sales pina s , gusto ng Malayalam makauwi how much more than just as t y.
Hi! Can anyone know how to get at DFA aseana if I'm from Bulacan. Please Help me po. I'll have to be there on Oct. 15, 2014.
paano makarating sa DFA paranaque from bacoor cavite? hi! what if galing po ng quiapo church? anu po pdeng means of transpo? Ano po ang sasakyan ko papuntang moa taga angeles pampanga ako??? saan po sasakay if galing ako bacoor papunta po ng dfa aseana? Hi. Anu po bang bus ang pupwedeng saktan para mkarating sa guadalupe galing sa quezon ave. Kasi madalas punuan ang mrt ei. Reply po asap. Tnx. if galing po ng Bulacan, paano po pumuntang dfa aseana? January 8, 2016 at 4:50 PM This comment has been removed by the author. goodday maam / sir, itatanong ko lang po kung papano yung sa aunthentication ko yung sa RED RIBBON po. nag pasa ako nung february 19 2016. walang sched na nakalagy sa stub ko sabi nung babae sa cashier sa may region III sa pampanga itatawag nalng daw kung kaialn ang release. but till now wala pang tawag sakin sa aseana ko daw makukuha ung pinasa ko. badly needed. salamat po sa makakatulong . Hi, pano po pumunta sa new dfa office near at moa pag galing lrt buendia? Or moa na mismo ano sasakyan? Pls po give me a clear direction! boss good pm pa HELP. im from cebu po and now im here in manila applying as a seaman. sabi kase nang parents ko dali lang daw mag process dto sa manila thats why dito nlang ako mag process. i was schocked na scheduling pala pag process nang passport dito. i tried having an appointment sa site nila pero ang tatagal pa ng mga schedule :-( i need it so badly kase one of the requirements :-( pwede ba pumunta don sa dfa main office as walk ins? kase as i check sa site wala silang schedule. help po kung ano ang solution sa aking problema. waiting for your reply po. Good afternoon! I renewed my passport last April 15 2016, it is a rush. It will be released yesterday april 26. Tinawagan ko ang LBC dahil ppina deliver ko po subalit ang sabi ng LBC operator from DFA-aseana kung saan ako nag apply e nag -update daw po kayo ng inyong system. I just want to know if the DFA-aseana ay nag uupdate ba tlga kaya d ni release ang passport ko? :) salamat! hi pede po ba ako pumila kahit walang appointment? at di po ba aq hahanapanng src? Good evening po d2 po kmi sa baliwag bulacan manggagaling , ano po ang sasakyan namin na hindi kmi sasakay ng LRT, napakadami po kz nakapila sa LRT.. tnx.. Ask ko lang po ano sasakyan apuntang DFA Aseana manggagagaling ako dito sa Sta. Rosa City, Laguna. I need immediate response. Thanks a lot! Pano po pag galing airport? ano yung route? HI po, d po pwede walk in dapat mo may appointment. July 19, 2016 at 6:17 PM This comment has been removed by the author. July 19, 2016 at 6:18 PM This comment has been removed by the author. Company ID, SSS , Drivers License, Postal, Kung anu pong ID na meron kau na Hindi po expired. Dalhin po ninyo lahat Kung anung meron ID kayo at i-photo copy. Wala nman pong mawawala, para Hindi ka po pabalik balik. Bus po na pa BACLARAN, sabihin nyo na lang po ibaba kayo Sa Aseana DFA. Ang daan po kasi ng bus ay Sa harap po ng DFA tatawid lang po. July 19, 2016 at 6:51 PM This comment has been removed by the author. Pagdating mo Sa alabang sakay ka ng pa baclaran tapos sabihin mo ibaba ka sa Toxas BLvrd corner BRADCO ST., lagpas Lang in ng Lydias. Tawid ka Lang po tapos konting lakad DFA na. Voters ID, wag po kalimutan ang original na Authinticated NSO BIrth certificate. Sa anak nyo po Kung nag aaral school ID or baptismal certificate at NSO BC. ATTN DFA - MOA. YUNG PAMANGKIN KO NA SI JOMIL, AY NA OFFLOAD AT PINAHIRAPAN SA PABALIKBALIK NG MAHIGIT ISANG LINGGO DYAN SA OFFICE NYO. KESYO FAKE DAW YUNG DFA AFFIDAVIT GALING DUBAI AT YUNG PIRMA KO. MAY RECIBO YAN NG DFA DUBAI NA BINAYRAN DITO AT HINDI THANK YOU LANG. BAKIT HINDI NINYO I VERIFY SA CAshier dito sa dfa dubai para malaman nyo kung peke o hindi. Ngayun basta basta nyo nalang i confiscate yung papeles at hindi ibababalik. paano namin ma justify na hindi iyan fake kung hindi nyo ibabalik. at paano ko kayo makakausap para maliwanagan kung hindi nyo rin sinasagot yung phone! Tapos magrereklamo lang sabihin nyo ililista na as part ng mga Blacklisted???? ano yan!!!! he is only 22 years old at walang idea sa mga nagyayari tapos maka experience ng ganyan! SANA MABIGYAN KAYO NG LEKSYON!!! pano po makakapunta sa dfa aseana galing fti taguig. pls help. ty. hi po,gud eve..very impt.lng po nid 2 know if open po b ng sat ang DFA ASEANA office branch..please tel me asap coz sked.qo po knina bumalik but i really cant make it so hoping tom will be fine is it? Galing po ng Pasay partas terminal po. How to get there salamat po. Good morning po.ask ko lang po anong sasakyan pagkagaling ng Cavite? 1st time ko po maglakbay mag isa going to Aseana Dfa.thanks po.God bless. Paano po kapag pauwi na? May bus po ba doon pa MOA or PaCubao? Thanks. Hi paano po papunta ng dfa aseana from tagaytay city. Ask ko lang po..pag galing sm fairview..ano pong sasakyan ko papunta dfa aseana? Hello. Hanggang anong oras lang po.ba ang pagpapared ribbon sa may dfa main sa Pasay? Saan po ba pweding magtanung about passport port corcern? From Dampa (Seafood restaurant), ano pwede sakyan going to DFA/ Aseana? Wla po bang bayad ang passport jan sa dfa? Mapa rush man sya o regular? ano pong sasakyan pag galing sa joybus/genesis bus station sa pasay papunta sa dfa aseana? Ask ko lang po galing san miguel ,pa guide po ..punta dfa aseana..
Hello po.. Tanong ko lang po paano po ba pumunta sa pasay dfa main office mangagaling po dito sa lipa batangas ano po sasakyan at san po ang baba. Salamat po. Are you referring to cleaning a crystal item? The simplest way to make crystal shine is to soak the item in a mild dishwashing soap with warm water. Wash the glass and then give it a vinegar and water bath. This is done by using white vinegar and warm water, equal parts. Everyone is saying how this law is the reason Zimmerman might get away with murder; however, I see 2 interpretations of this law in what happened that night. Zimmerman said he shot in self defense, when all the evidence, the 911 calls, etc, show that he pursued Treyvon against bachelorette party shirts the big brother t shirt wishes and requests of the 911 dispatchers. When police arrived, there were wounds on Zimmerman from an altercation. Hello po.. Pano po kaya ung pinakamabilis na sakayan comute from naia airport to DFA manila po? Thanks po sa sagot..